Along with the 2010 Ford Transit Connect, Ford has formally announced the Transit Connect will indeed be the battery electric van announced in December. Many an interesting detail ahead. 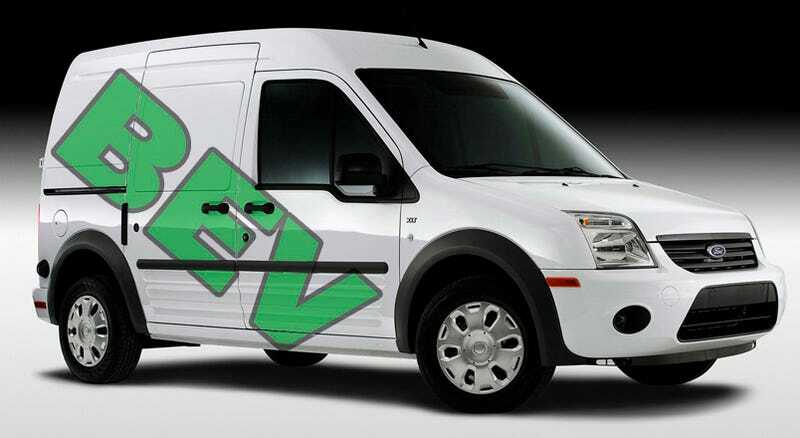 The Transit Connect represents a new entry into a vacant commercial market in the US, and as such Ford is planning on entering with both barrels blazing. Aside from the standard gas engine Transit Connect, Ford is planning to introduce two varieties of all-electric Transit available in the second half of 2010. Since most commercial market buyers know the daily range of their vehicles they'll be able to buy for their targeted range, the entry level version will come with a 60 mile lithium ion battery and the buyer can opt for a 100 mile if their application calls for it. The commercial entry for EV makes a lot of sense when you consider the vehicles will be under the most severe duty cycles as well as closely monitored by fleet operators, it makes collecting field data an engineers dream. As noteworthy as the actual van is, the production method merits a mention as well. The rolling chassis and interior will be assembled right next to the regular Transit Connect, but at the point where the powertrain is set for installation, the BEV Transit Connect will get nothing. The unfinished vehicle then gets shipped to its destination port, where it will be delivered to longtime EV outfitter Smith Electric Vehicles, who will install the batteries, power control module, and 50 KW drive unit, as well as wrap up the final assembly elements. Then it's back on the truck for delivery to the local dealer. The idea of an electric Transit Connect is interesting, but it's only a part of Ford's electric and hybrid strategy going forward. They've also announced an electric small car for 2011, the Ford version of the next-generation hybrid in 2012 and a plug-in hybrid for 2012. This seemingly aggressive timing reflects the last few years of non-stop work on electrification coming to fruition. Considering that timing on the small car, we wouldn't be shocked (heh) to see either the Ford Fiesta or the next generation C1 global platform Ford Focus hitting dealers in electric form. DEARBORN, Mich., Feb. 9, 2009 – Ford Motor Company today announced plans to market a pure battery electric-powered light commercial vehicle in North America, based on the all-new Transit Connect global commercial vehicle platform. "The new Transit Connect light commercial vehicle with battery electric power represents the next logical step in our pursuit of even greater fuel economy and sustainability," said Derrick Kuzak, Ford's group vice president of Global Product Development. "A growing number of our commercial vehicle fleet clients have expressed interest in electrification as a sustainable mobility solution. By leveraging our global team and asset portfolio, we're able to quickly bring this environmentally friendly, strong ‘silent type' to market." The use of a global commercial vehicle platform showcases Ford's ability to deliver products with worldwide marketing opportunities. Powering this electrification drive is the company's "One Ford" global product vision. Ford is working with Smith Electric Vehicles, the European market's leading battery electric upfitter of commercial vehicles, which is part of the U.K.-based Tanfield Group of companies. Since 1920, Smith has converted tens of thousands of vehicles to battery electric power. In the U.K. and select European markets, Smith already offers battery electric versions of the Ford Transit Connect and also the Ford Transit Connect medium commercial vehicle to fleet customers. Ford Transit Connect has been a global success. Its unique combination of car-like driving dynamics, cargo capacity, accessibility and low costs of entry and operation make it a logical platform for battery electric power. Transit Connect has been designed, engineered and manufactured by Ford of Europe on a dedicated global commercial vehicle platform to beat tough, light commercial vehicle durability standards. Many commercial users travel predictable, short-range routes, with lots of stop and go in urban and suburban environments. For companies aiming for sustainable mobility solutions, Transit Connect with battery electric power can help them deliver in an environmentally friendly way. A range of up to 100 miles makes Transit Connect a useful hauler, with significantly reduced operation and maintenance costs over the long haul. Numerous federal and regional programs offer incentives for companies to electrify their fleets. Ford Transit Connect with battery electric power will be available in select U.S. Ford dealerships in 2010.